How to Transfer Apple Music to Android Samsung/Huawei/OnePlus etc? Apple Music has exclusive music you can't find elsewhere, but the songs are often protected by Apple DRM protection. Thus, you can't listen to Apple Music on Android or any other unauthorized MP3 players outside Apple walled graden. If you want to enjoy Apple Music M4P M4A on Android phone from Samsung, Huawei, HTC, etc brand, here is the detailed information about how to transfer Apple Music to Android like Samsung, Huawei, OnePlus, etc. How to Convert Apple Music to MP3 for Android Phones? An iOS data backup and transfer tool to help transfer Apple Music to Android phones or tablets, easy and fast. Make it possible for Apple Music sharing to friends and playing on any MP3 player. ★ DRM-free the iTunes purchases: movies, TV shows, books, etc. Since November in 2015, you can free download Apple Music app on your Android device in Google Play store to access millions of songs in Apple Music freely. If you had subscribed to Apple Music before, you can directly sign in Apple Music on your Android device with the same Apple ID and password. Then, you can have your Apple Music synced to Android easily. If needed, you can also get Apple Music on Android as many as possible to listen to offline as you do on iPhone handset. Pros: You can browse songs worldwide, create your own playlist, and play purchased iTunes music. 1. This way requires you to have a devices in Android 4.3 (Jelly Bean) or later. 2. This method is only suitable for who has subscribed to Apple Music. If you want to cancel the Apple Music subscription, you can't use the Apple Music app to listen to Apple Music on Android anymore, even the downloaded songs won't work neither. 3. If you want to share your Apple Music songs to your friends who use Android phones, this way is also not that satisfactory. It is better to be the same person, as your friends will be asked to log in with the same Apple ID, and Apple will also ask for the phone number to check whether it is the same number to relate to the Apple Music account when signing in with the wireless carrier. If the number is right, you have right to access to Apple Music on Android. 4. Some regions don't offer Google Play store to Apple Music download for Android. 5. Apple Music app for Android can't be used as a MP3 player to play local music files on Android. Obviously, the disadvantages of Apple Music app for Android surpass the advantages. So, you are suggested to try method 2. By removing the Apple Music DRM protection, you can freely transfer Apple Music to Android devices without restrictions, share Apple Music with friends or families over the Internet, play Apple Music on computer without iTunes but with the desktop media player, or enjoy Apple Music on the go with your walkman or portable MP3 player. 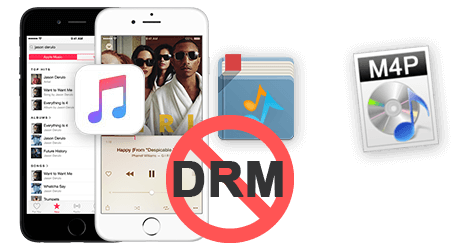 The tool we will use here is DearMob iPhone Manager, a professional DRM removal tool for removing DRM protection from Apple Music and iTunes purchases like movies, TV shows and books. To make it possible for you to get Apple Music on Android, DearMob iPhone Manager will help convert Apple Music M4P M4A to MP3 or WMA for any Android devices, be it Samsung Galaxy S10, Huawei Mate 20 or OnePlus. How to Transfer Apple Music to Android with DearMob iPhone Manager? 1. 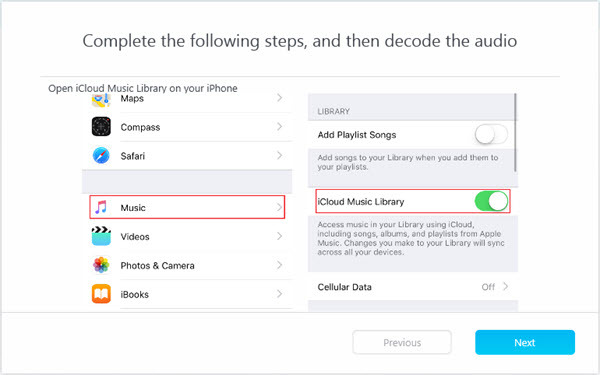 Go to settings on your iPhone handset, scroll down to find Apple Music app and turn on iCloud Music Library. Then, open your Apple Music app to find songs to add to your music library. 2. Install iTunes on your computer, and sign in to the iTunes Store with your Apple ID. Then, click on Edit on the top left corner to choose Preferences, and check iCloud Music Library. After that, download the Apple Music from cloud on iTunes you just added to your music library on iPhone. Then, click OK. Now, you can use DearMob iPhone Manager to remove DRM from Apple Music. Step 3. After connection, click on the Music Manager icon on the main UI of DearMob iPhone Manager. Here, you will see the Apple Music you want to transfer to Android. Step 4. Choose them and click on Export on the top bar, then DearMob iPhone Manager will start exporting them and also offer a Decode button for you to remove Apple Music DRM. Just hit the button and follow what DearMob iPhone Manager tells you. Then, DearMob iPhone Manager will start decrypting your Apple Music to Android supported audio format. After removing the DRM, there will pop up a new window where your DRM-free Apple Music songs are stored here. Just USB connect your Android phone to the computer, then drag and drop the Apple Music you just decrypted to the music folder on your Android to finish syncing Apple Music to Android. Now, you can listen to Apple Music on Android at will. BTW, besides helping transfer Apple Music to Android, DearMob iPhone Manager can also help transfer photos from iPhone to Android, sync contacts from iPhone to Android, remove any iTunes purchases for Android, and more.